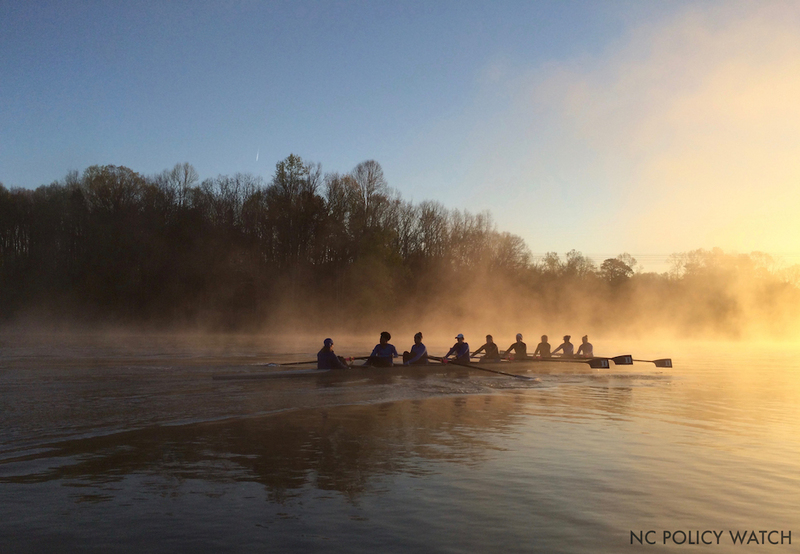 In early spring, Lake Michie stirs to life, with fishers and the Duke University women’s rowing team taking to the water at dawn. The 480-acre reservoir near Bahama is not only a source of largemouth bass, but it is also a boating destination, and it provides Durham with 30 million to 35 million gallons of drinking water each day. 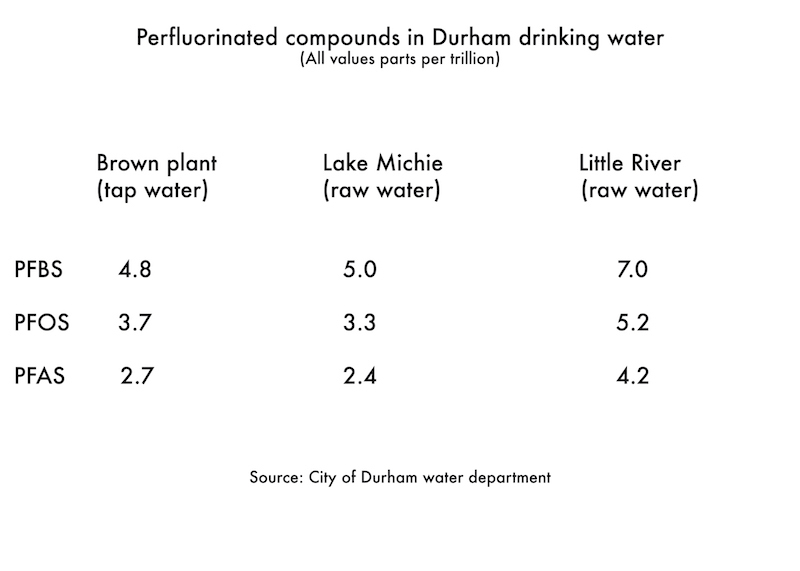 Of the three compounds found in Durham’s water supply, only PFB is still commercially produced. It is used in flame retardants, metal plating, pesticides and water-repellant coatings. The Town of Cary recently tested its drinking water and found levels of PFB ranging from 3.6 ppt to 3.9 ppt; Durham’s one result was higher, at 4.8 ppt. Eighteen utilities in Alabama, Georgia, Pennsylvania and Colorado have detected levels of PFB above EPA health advisory goals in their drinking water, according to the Environmental Working Group database. The EPA has required companies to phase out PFOA, used to make Teflon, and PFOS, an ingredient in Scotchgard. Nonetheless, the compounds remain ubiquitous in the environment, and people can be exposed to them in numerous ways, including microwave popcorn bags. There was little public awareness of perfluorinated compounds and GenX until last year, when the Star-News of Wilmington reported on findings in the Cape Fear River by NC State University researchers. Since then, state lawmakers have tried but failed — for political reasons — to pass substantive legislation to fund the NC Department of Environmental Quality to tackle the problem of emerging contaminants statewide. Late last year, Duke University scientists Lee Ferguson and Heather Stapleton found a variety of perfluorinated compounds in Jordan Lake, the drinking water supply for Cary and other southern Wake County communities. Ferguson, who was on the Sierra Club panel, said the only way to “avoid being taken by surprise” by the presence of emerging contaminants is to conduct routine non-targeted monitoring — looking for chemical compounds, both known and unknown, in water. It requires expensive high-resolution mass spectrometers, as well as staff trained on that equipment, which DEQ does not have. Ferguson said he and other academic scientists have met with DEQ, EPA and several state lawmakers to pitch a bill to fund the NC Emerging Contaminant Observatory. “It’s an early warning alarm system,” Ferguson said, similar to one in Basel, Switzerland, that would detect water contamination in real-time.